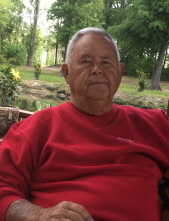 Jerry William Miller, 79 of Cordele, passed away Saturday, March 30, 2019 at his residence. Funeral services will be held at 2:00 p.m. Monday, April 1, 2019 at Lake Blackshear Baptist Church. The committal service will follow in Cedar Creek Cemetery. The family will receive friends Sunday evening from 5:00 until 7:00 p.m. at Rainey Family Funeral services. Jerry was born in Colquitt and was the son of the late Roy and Kate Williams Miller. He was retired from the United Sates Air Force as a Senior Master Sargent with 20 years service to his country. The owner and operator of Jerry's Backhoe Service for 33 years, Jerry enjoyed his time outdoors working and building ponds. He worked for several years with the Crisp County Fire Department and was an active member of Lake Blackshear Baptist Church. He is survived by his wife of 54 years, Laverne Smith Miller of Cordele; a son and his wife, Vernon and Teresa Smith of Cordele; four grandsons and their wives, Jimmy and Autumn Smith, Andy and Karie Smith, Michael and Safa Smith and Donnie and Suzzanne Smith, all of Cordele; great-grandchildren, Julianna Smith, Avelyn Smith, Jimmy "Deuce" Smith, Carter Smith, Summer Smith, Charles Smith, Hagan Smith, Payton Smith and Kolton Smith. He was preceded in death by his great-grandson, Cohen Smith. To plant a tree in memory of Jerry William Miller, please visit our Tribute Store. "Email Address" would like to share the life celebration of Jerry William Miller. Click on the "link" to go to share a favorite memory or leave a condolence message for the family.